Before a correction for time depth could be applied, we needed to estimate the rate of the interspecific molecular clock. We used ML and a calibration point of 7 mya for the Pan-Homo mtDNA separation to estimate the interspecific mutation rate. Soares et al. were cautious, and they assumed an earlier Human-Chimp split than had been favored until then. However, a new paper by Langergraber et al. 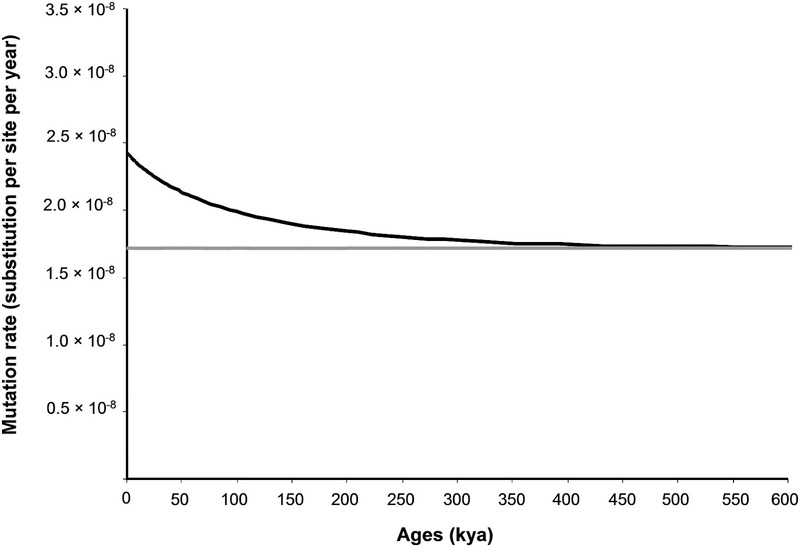 have used direct observation of the autosomal mutation rate and of ape generation lengths to argue for an even earlier Human-Chimp split: at least 7-8 million years ago, and as many as 13 million. The new estimation of the Pan-Homo split seems to have implications for the mtDNA clock as well, because the latter was calibrated on this split: hence mtDNA variation between Humans and Chimps may have accumulated for a longer time, leading to a slower long-term mutation rate. If the earlier Pan-Homo split is accepted, it would appear that Mitochondrial Eve may have lived earlier than commonly thought, perhaps by a substantial amount relative to the current 177ky estimate. If that is the case, then she may very well have not been an anatomically modern human, perhaps a late H. heidelbergensis individual in a population that was on its way to becoming H. sapiens. The implications need to be worked out, and factors affecting uncertainties in age estimates must be tightened. For example, the autosomal mutation rate will probably be known much more precisely in the coming years as full genome sequencing of parent-offspring pairs or trios becomes routine. But, for the time being, we ought to be cautious in our treatment of mtDNA ages and their correlations with archaeological or anthropological phenomena. "If that is the case, then she may very well have not been an anatomically modern human"
I have long wondered why everyone seems to assume mtEve had to have been anatomically modern. I see no need at all to make such an assumption.